Paul Andrew Wandless is assistant professor of art at Harold Washington College in Chicago, Illinois. 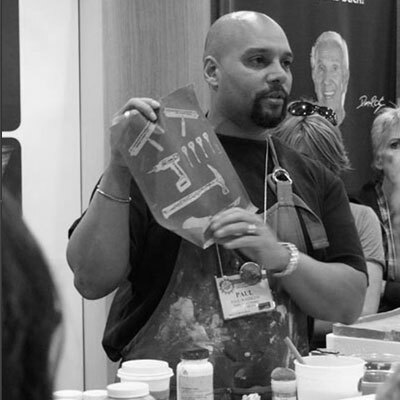 He is recognized for his numerous publications about alternative clay techniques, including the ceramic print. He is the author of Image Transfer on Clay and co-author of Alternative Kilns and Firing Techniques: Raku, Sagger, Pit and Barrel, both published by Lark Books. Professor Wandless received his MFA from Arizona State and is a former board member of NCECA. Currently he is the special director of video for NCECA. His recent exhibitions include a solo exhibition at the Plinth Gallery, in Denver, Colorado: The Ceramic Print at the Lill Street Gallery in Chicago, Illinois; and Beyond Embargo: Cuban and American Ceramics at the Fuller Crafts Museum in Brocton, Massachusetts. Jurying an exhibition is always a challenging task. The selected works will always be a reflection of the aesthetic philosophy of the individual making the choices. With that being said, I wanted to share my approach to how I selected the awards and juried the exhibition.